The 68060 is not fully pipelined. This means FADD throughput is 1/3 clocks. 1) Our FPU is FULLY pipelined. We can have a throughput of 1 FMAD per clock. 2) Our FPU units are independent and can work in parallel. This means we can have a throughput of not only 1 FADD per clock. But also 1 FMUL per clock. This means with good code you have 2 FLOPS per cycle. 3) The 68K FPU design is limited by 2 operants ISA encoding. The 2 Operant encoding create the need for many "filler" FMOVE instructions. These instruction create unneeded dependency chains and lower the FPU performance. Our is internally a 3 Operant machine. By for example FUSING FMOVE+FADD or FMOVE+FMUL we can create a much higher throughput than all previous 68K-FPU. If you take the above differences into account the you see that we can provide 10 times higher performance than 68060. But today there is NO software written to use this power. To use this full power potential, the software needs to be be written use the Super-Scalarity really efficiently - this is best done in ASM. There are also some challenges in writing this. As while the throughput is super, all FPU instructions still have a latency. This means perfect FPU code needs to consider this. A good coder good do with something - never seen on AMIGA before. If coder show the will to do this, to write a small but Killa-app, and has the will to test/profile/debug the FPU design with this - which can take several month. Then we will happily support this. Seems they have a concept in mind but it's not their priority to spend time and resources right now to both develop and test it. Last edited by ErikBauer on 05-May-2017 at 01:09 PM. There is already an MMX enabled version of Riva Player and the MMX instructions make a big difference compared to the normal executable. There is barely any software for AMMX, and for those few tasks that benefit from it - well, that one that benefit from it - Riva - there are just so many other much better solutions on other platforms, if you really need it. Seems most of the people do not know about what they are talking. I'm a Scientific Software Developer, that means floating point calculations are my "bread and butter". Single/Float (32Bit) is for most of the calculations usually enough. a 1.000 km wide area you can make precise down to 1 pm (10^-12 m) or 1.000.000 km (remember circumfence of Earths 25.000 km ) down to 1 nm (10^-9 m, remember wavelength of light around 500 nm). Did you notice something odd on your x86_64 PC in contrast to your i386-pc? in terms of floating point calculations? No? Good, that means you do not need 80bit floats. AMD/Intel marked the FPU as deprecated for x86_64 and all the 64 bit programs you are using, do not use the FPU at all, because it's very slow and old. All new floating point calculations on Intel/AND Processors are done with SSE2/SSE3 which does not have a extended float mode (80 bit) only single (32 bit) and double (64 bit). Even worse the SSE2/SSE3 floating point calculations does not have any SIN/CoSin/EXP and so on (as the FPU had) but Intel and AMD give out special routines (Google "Intel Approximate Math") these routines are very long (about a page assembler code) but much faster than the one line FPU. Just curious: a Gigaflop FPU? you are having a FPGA running with GHz and more? :-O or you can do 10 fpu commands in one cycle (100 MHz + 10 FPU commands/cycle = 1GFlops)? :O I'm a little surprised. But if so I'm very happy. And I personally dont fall into the 2 camps being drawn up here. I dont play much game anymore (I used to, alot, but Ive largely left those days behind me. Altho I do gather 10-16 of my RL friends at my place every 3-4 months where we do play games, drink and just hang out). Nor do I use the computer much for creative things, altho a powerful paintprogram is always welcome. And I suspect there are many more like me, that doesnt default to the creative OR gamer categories. FPU seems to be on the roadmap anyhow, its just a matter of the one resource we never can get enough of; TIME. To be honest I'm waiting the standalone mostly for gaming. I have a good collection of games, installed or whdloaded that i use with WinUae. It will be fun to play them on a 68K HW again. Last edited by NutsAboutAmiga on 06-May-2017 at 09:16 AM. Last edited by IanP on 06-May-2017 at 09:58 AM. Notice the 4mb chip ram in Gunnars picture? Last edited by Overflow on 06-May-2017 at 11:45 AM. Last edited by Overflow on 06-May-2017 at 11:07 AM. Last edited by Overflow on 06-May-2017 at 10:55 AM. Since I do not game, that portion of the FPU debate does not bother me. However, a few serious applications do take advantage of an FPU. While some programs, especially Lightwave 3D, offer both non-FPU & FPU versions. I believe a few don't. I would love to have an FPU option when my Vampire 500+ is up and running. I have a non-FPU version of LightWave 3.5 at the ready for my Vampire (which arrived today!!!). However, I only have an fpu version of LightWave 5. Not sure if there is an integer edition of the later version, so I of course I am hoping for the Vampire FPU to be implemented and be fully compatible. I can be patient, but still eager for it to happen. Congratz on the arrival of your Vampire board, is it for the A600, or have the A500 versions begun shipping also? I am hoping for the Vampire FPU to be implemented and be fully compatible. I can be patient, but still eager for it to happen. fyi, just in case you have really missed it..
@Gunnar: Just curious: a Gigaflop FPU? you are having a FPGA running with GHz and more? :-O or you can do 10 fpu commands in one cycle (100 MHz + 10 FPU commands/cycle = 1GFlops)? :O I'm a little surprised. But if so I'm very happy. Serious facepalm with that one. Look...I'd just settle for a compatible FPU. Extending floating point calculation capabilities with instructions tailored primarily for multimedia applications...can't we do that later? BUT, thank you so much for calling them out on the Gigaflop FPU BS. Thanks. Mine is for the A500. I'm not home, but looking forward to installing it when I am home Sunday evening. 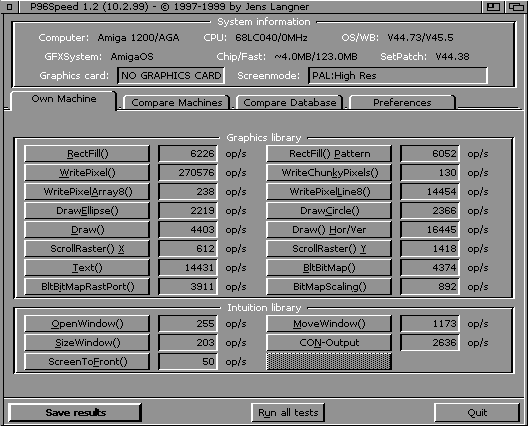 I now see in the near future the option to use faster FPGAs. FPGAs so fast that we can reach GIGAFLOPS with them. Zelda roth which was released yesterday for 68k and requires a Vampire for the extra horsepower runs natively on MorphOS. In case anyone is interested in giving the game a so. USB joystic is also supported too. Interesting it says it needs Vampire or UAE, but it also says it uses AMMX, so I guess it does really support UAE? or has now UAE support for AMMX? Last edited by NutsAboutAmiga on 07-May-2017 at 11:00 AM.